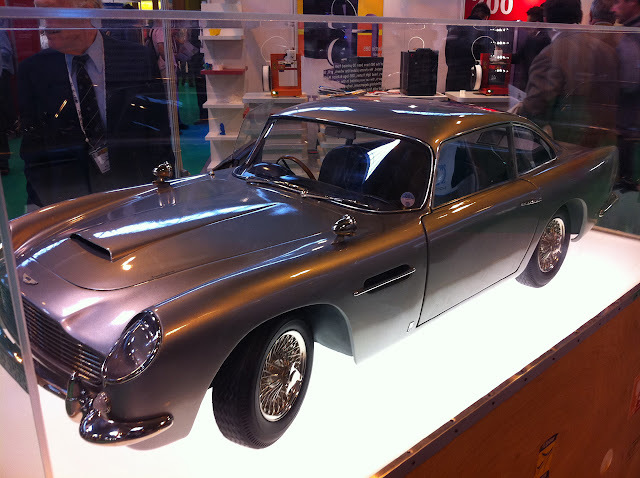 TCT2012 show report and Industry growing pains. 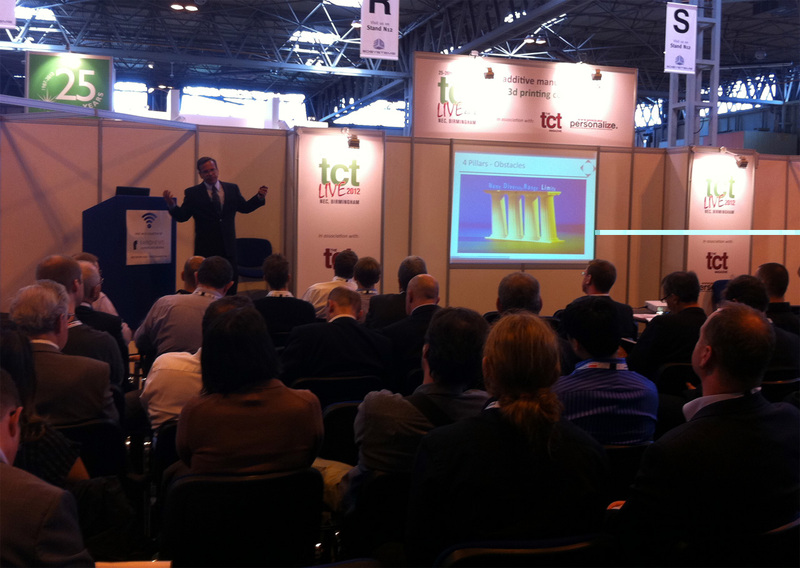 I visited the TCT Liveshow at the NEC in the UK this week. Todd Grimm opened the show with his presentation of where the 3D printing and Additive manufacturing industry is in it's life-cycle in a nutshell, "we are not yet ready for consumers using 3D printers"
I’m calling my dress code the ‘maker test’ would I get any attention at all from these companies?, I’m sad to say generally most of the companies failed, ignoring me for people in suits that actually had very little interest in their product offerings. Last year, only Bits from Bytes and A1 technology were representing the lower-end market sector and entry level machines. The A1 technology stand was empty; they didn’t turn up on Day 1. 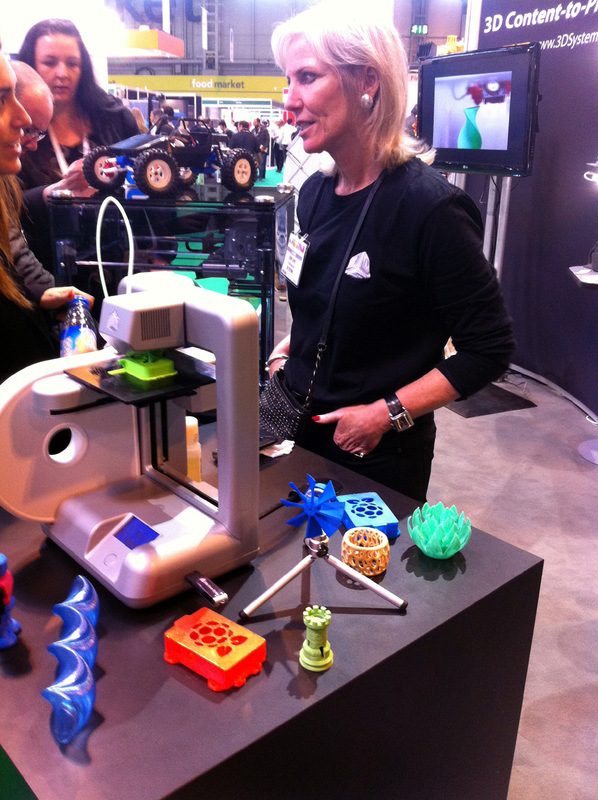 My very first stop was on the 3D systems stand, just by accident, but the Cube was on display at the front of the stand with the Cathy Lewis guarding the Cube printer. 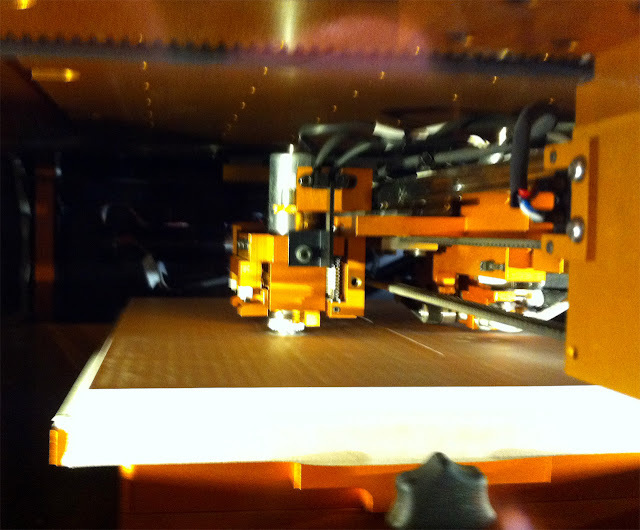 The Cube was trying to print, but unfortunately very badly, the drive mechanism looked like it was partially blocked resulting in terrible surface quality with lots of little holes and pips where variable extrusion was occurring. It was also printing very slowly and at one set speed (I estimate about 20mm/Sec), with only slightly faster travel speeds. What is it doing with that bridge? and why is the surface quality so bad. And why has it wasted Raft material on sections with nothing on them! - Poor software! I stood looking at the Cube for many minutes, many other people in suits asked the same things time and time over, how much is it “$1300” says Cathy, do you have a brochure, “no, sorry we don’t” – How much are the cartridges “$50 each, and they can print about 10 of these” – pointing to a 1.5” high chess piece. Finally, after everyone else had gone I said to Cathy it was nice to see a big company doing a reasonably low cost machine “yes, some people think we are crazy”. Well, you would have got it from Thingiverse, I said. At this point Cathy’s face says it all, she looks really uncomfortable and clearly wants to stop talking to me as soon as possible. We then briefly discussed what a Raspberry Pi actually was, Cathy had no interest whatsoever, and I was left wondering how they were going to sell and support this machine to the general user and enthusiast? In many ways it was worth going to the show just to see her face, in that moment and short conversation. 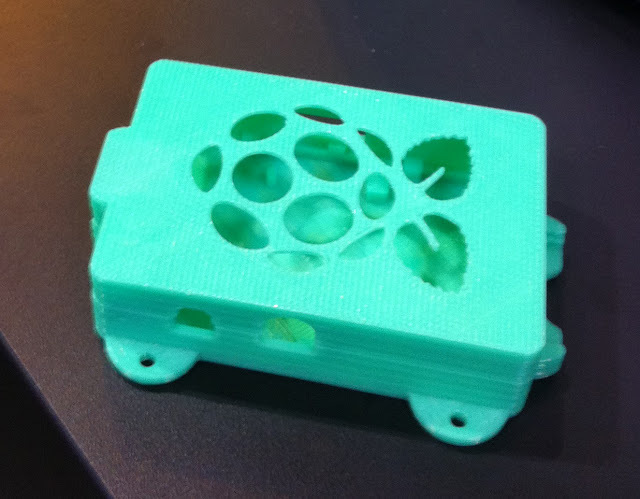 I then changed it in Sketchup after using a Raspberry Pi for a little while and released my derivative to Thingiverse. 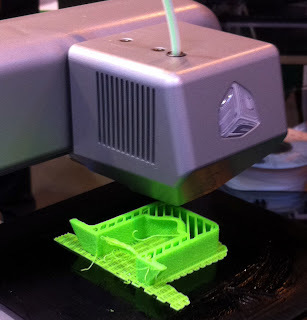 Makerbot had the Replicator V1 at the show, I didn’t see it actually printing anything all day, everyone else had running machines. If you want to be a Makerbot Distributer, the Minimum order quantity is 10 machines and for that they will give you 25% discount, Makerbot has two resellers in the UK, and they were very keen to sign up more on these terms. 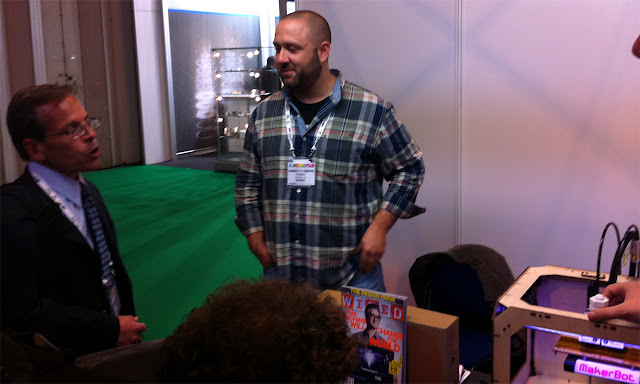 I was fortunate enough to be standing on the Makerbot stand when Todd Grimm asked the Senior American Makerbot Sales representative a few interesting questions, the response coloured by recent events and the Replicator 2 launch. 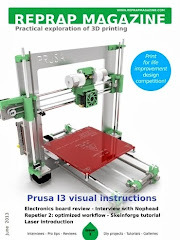 Todd asked about the Replicator 2, what makes this machine a pro grade (prosumer) machine and how is it different from Version1? Makerbot – It’s now 100micron layer resolution and we have tightly controlled PLA printing materials that deviate less than 100micron in size. 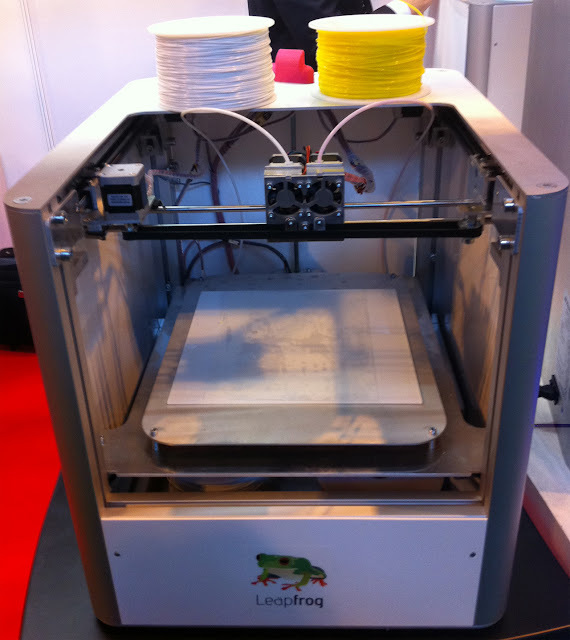 This machine is PLA only, we have removed the heated bed so users can get printing faster and we have a simple 3 point levelling system. It’s also a single extruder system only. I was thinking – That’s a lot to remove, why is it then so much more expensive than a Replicator V1? 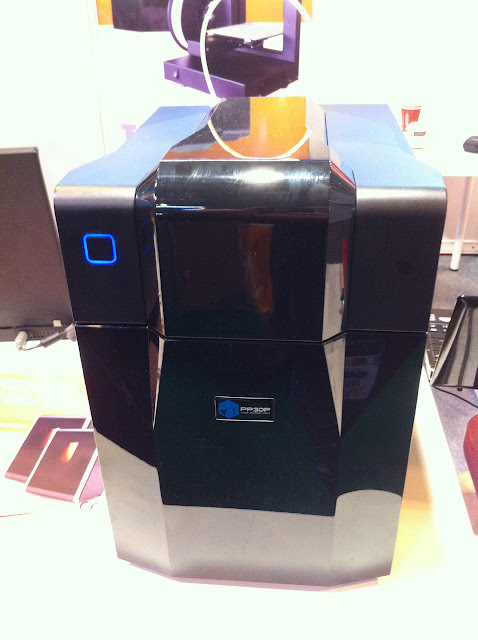 And can’t a Replicator V1 do 100micron? It should be able? The discussion continued, I moved on. 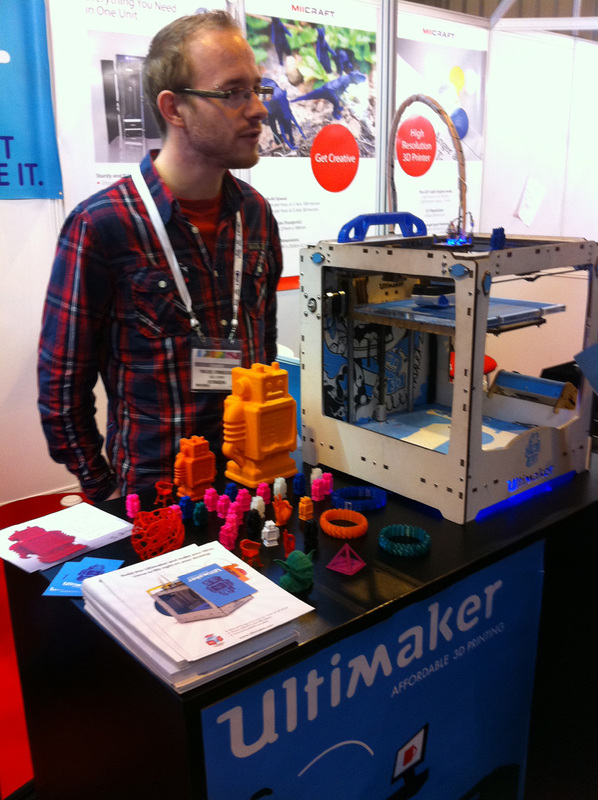 Sadly, they also failed the Maker test; I was reasonably ignored every time I went on their stand. I didn’t pick up a Makerbot sticker… Where would I put it now? 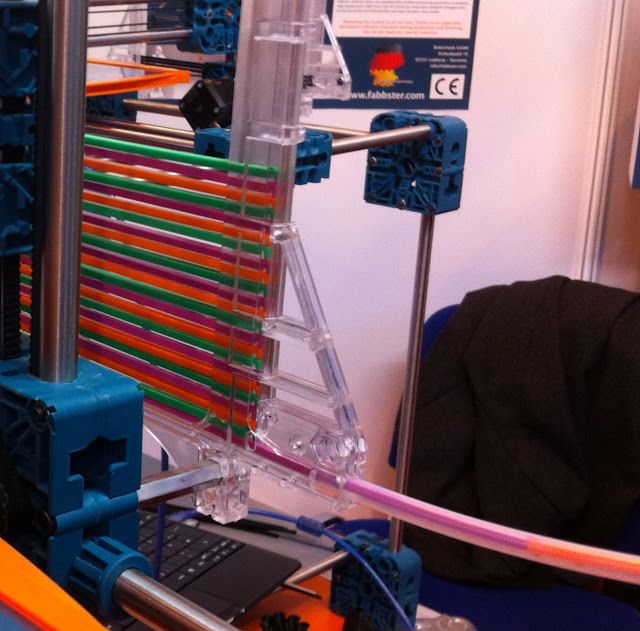 Maketbot are obviously seeing a change on Thingiverse, they are trying to focus on the Terms of Service questions that also sparked up debate and fractures in the community along with the bigger issue of going closed source – They even have their Lawyer trying to explain that ‘everything will be ok’ Trust us. Can people in the community trust a company that changes one of its most fundamental founding principal’s? Will Makerbot’s new Pro-sumer customer appear, and will 3D Systems now be free to take the entry level sector with the Cube? Do any of us now really care? It’s never a dull moment with 3D printing. 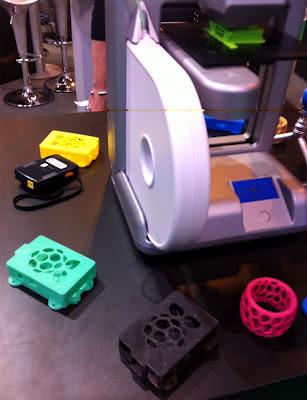 I do now wonder how different 3D systems and Makerbot will look in Jan2013 at the next CES? 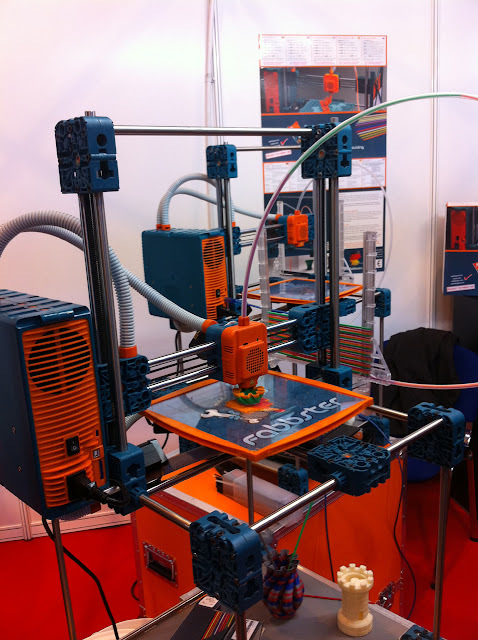 If it's consumers or pro-sumers they are after then maybe the closed source 3D printer war has now started, while the open source community just marches on regardless, I hope Makerbot does not regret it's decision. Also look out for the comment about the Replicator case looking wooden, I bet they was the point Replicator V2 got a metal overcoat! 3D printed Mug - Bits From Bytes had a separate bigger stand (last year just a corner of 3D systems) I spotted Ian Adkins and Ed Sells (Sells Mendel) walking around; they were doing a lot of research by the looks of things. Another one from BFB, they ignored me and so failed the 'Maker test' this time around. 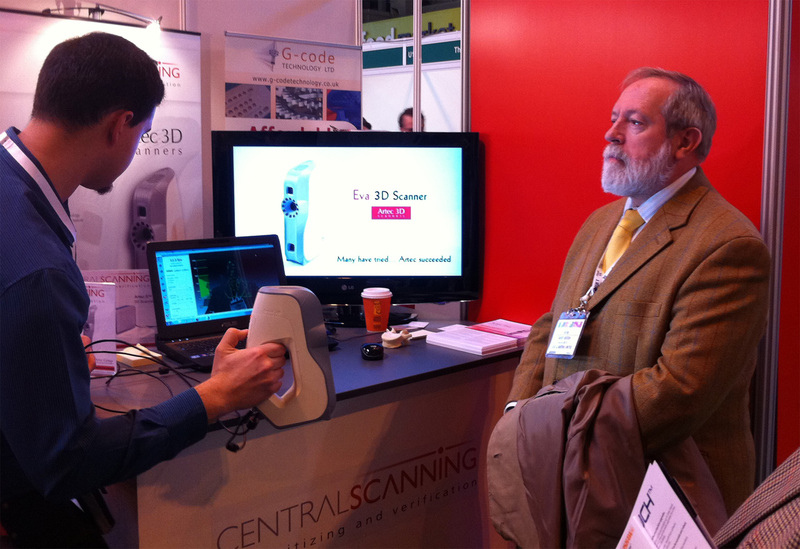 There was a lot of 3D scanners at the show, this chap with the beard was being 3D scanned with a hand-held unit. This is a Prop for a Film printed with a Voxeljet 3D printer - they can print 4m x 2m objects! 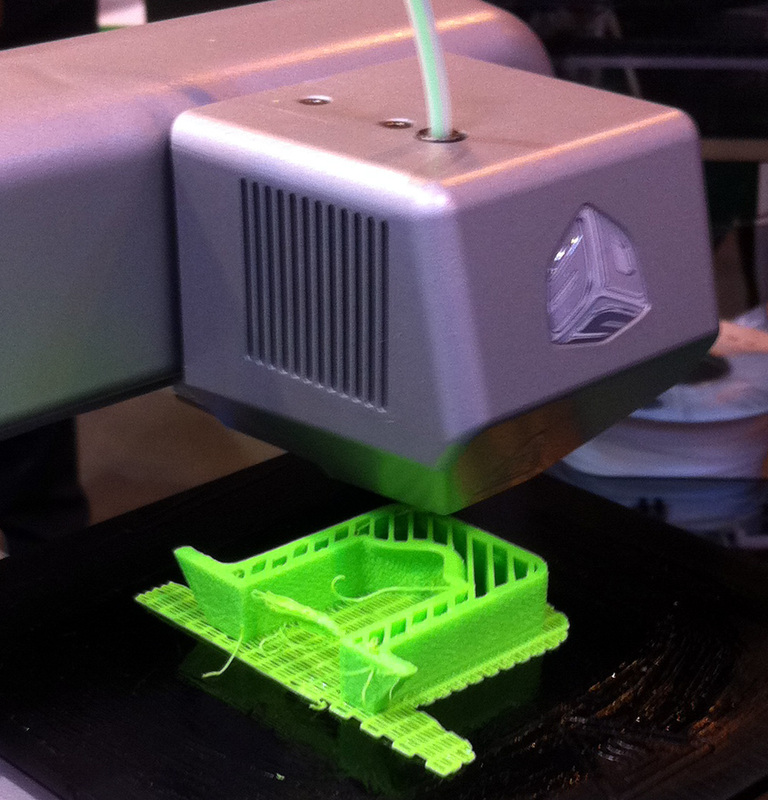 Voxeljet printers are used by Car companies to make massive prototype parts. Propshop model-makers Ltd - Passed the 'Maker test' with flying colours, he even showed me some secret new massive 3D printed models for a new film coming out on his iPad. Yea! Ultimaker! - Always had their machines running all day! 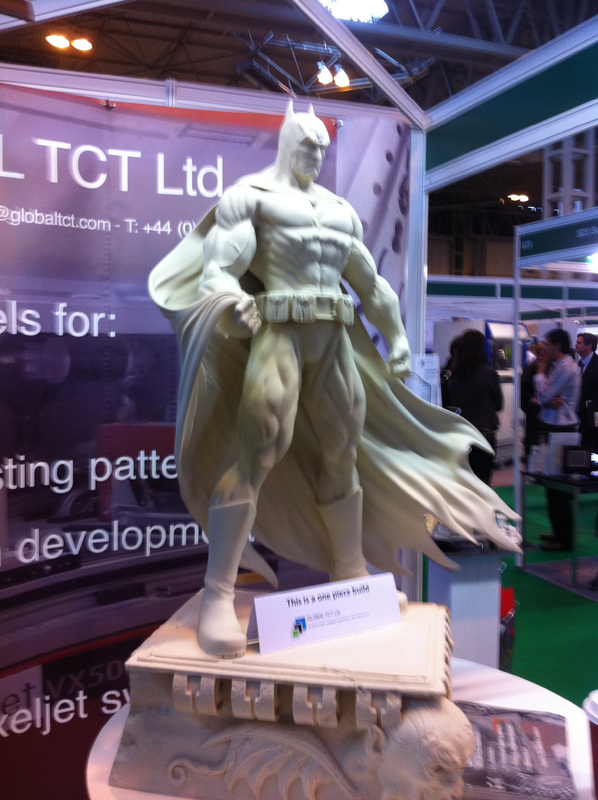 - They had the busiest stand out of almost everyone, including many of the really big names. Very friendly people and amazing quality things on display, thanks Ultimaker you made my Day! 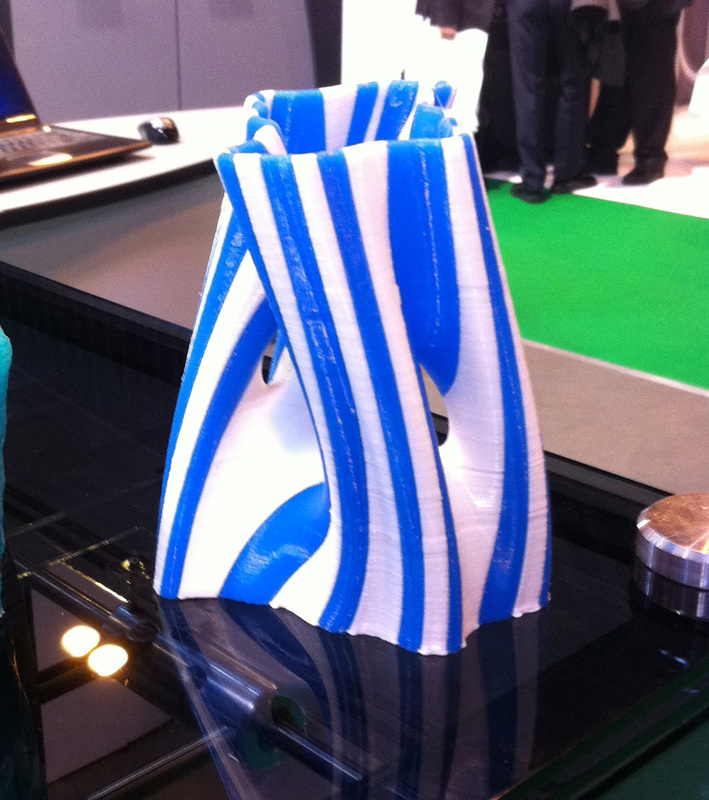 I also met Paul Candler on the Ultimaker stand, he has made some of the finest profiles for Netfabb. 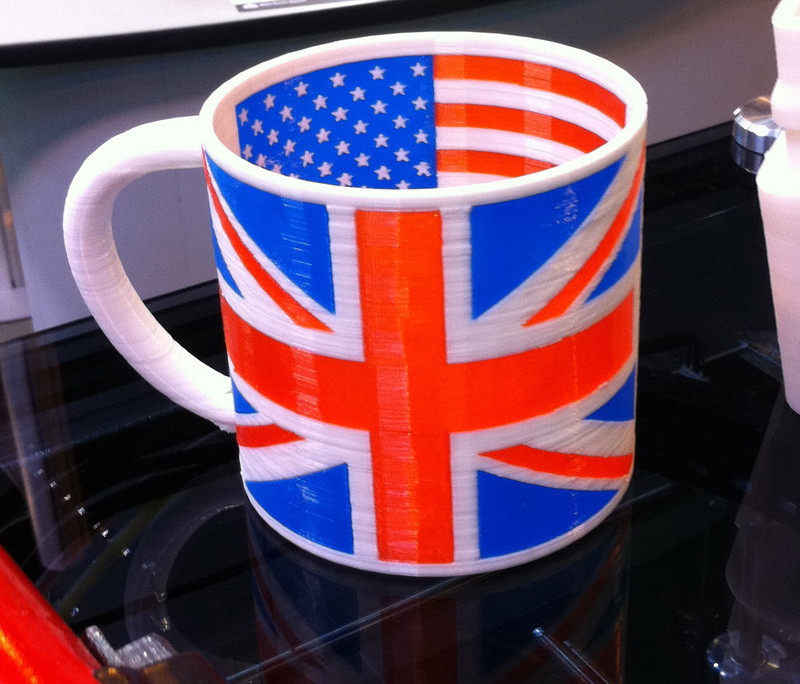 Ultimaker users are enjoying resolutions down to 20microns! Needless to say Ultimaker passed my Maker test. Fabbster have a Closed source printer (Sintermask) that operates in a similar to most RepRaps, it has no heated bed at the moment and uses Rafts for prints. Quality is reasonable. They have a patented stick deposit system, this is basically Injection moulded plastic sticks of material that are loaded into a magazine and snap together as they exit into a PTFE tube onto it's way to the extruder. 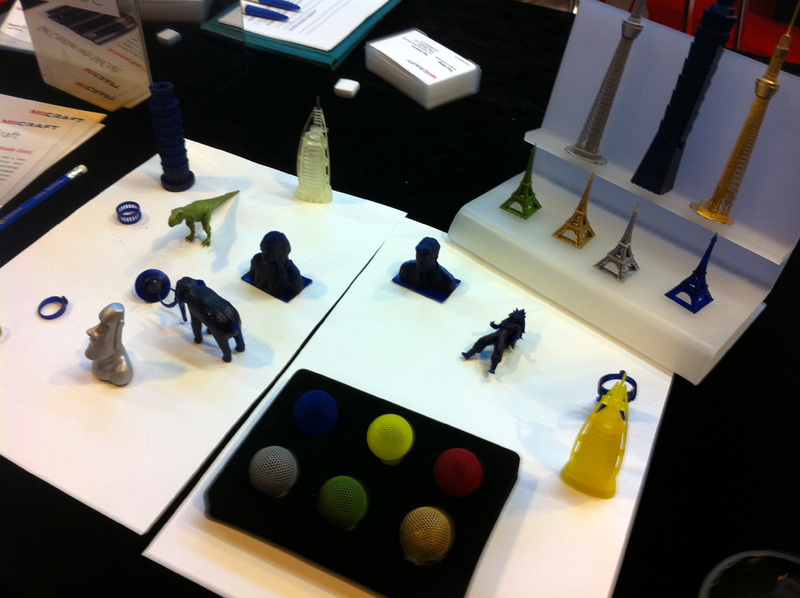 They have many materials including a flexible (soft PLA style) that was very nice to handle. The machine is big and well built. 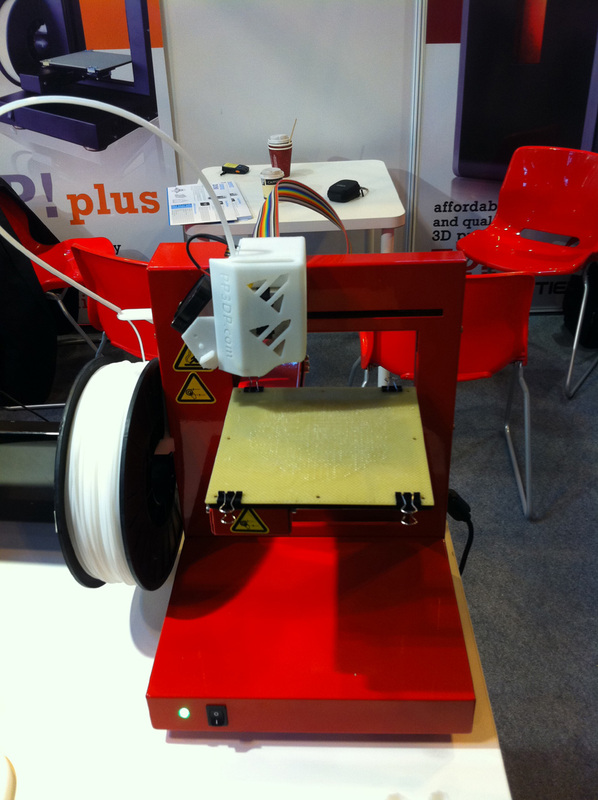 They were very nice at the show and passionate about people using their printers and materials. They passed the Maker test and we chatted for some time about the machine. 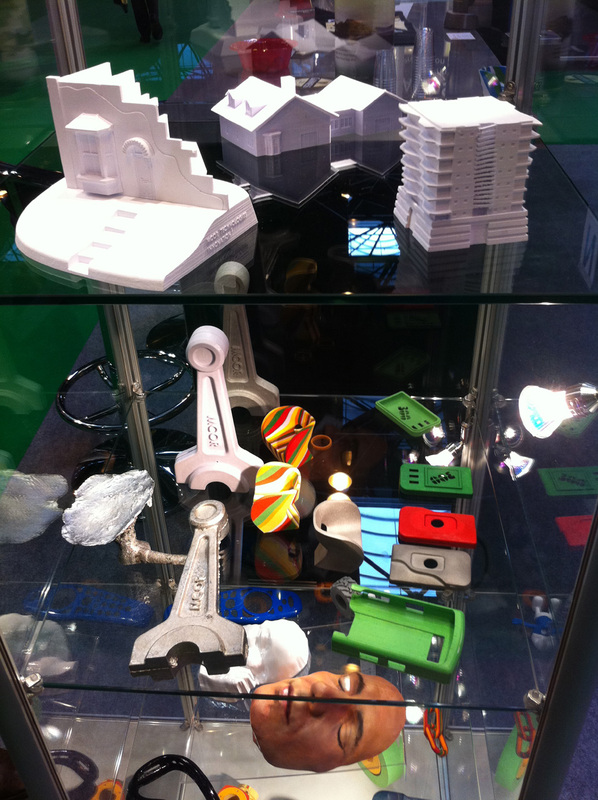 I ended up with a very bad photo of the Miicraft printer, so I'll just show some of the printed objects. 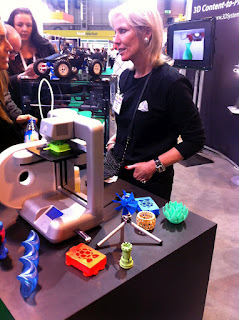 Very nice people and happy to tell and show you everything about their resin based 3D printer. 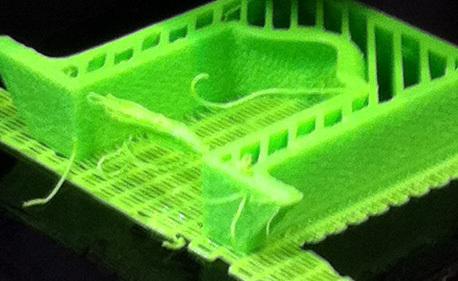 The PP3Dp printers are looking a little old now, but still performing well, if not a little slow to print. Didn't talk much, they were not really communicating with the people showing interest. They are all paper. I'm not sure it that's a good thing or not. They must be selling machines? and I expect they will do well in the movie industry, props, and animation maybe even some product design etc. but I can't quite see a good use as functional models and certainly not with consumers. Lots of other companies were at the show, some interesting, others looking very dated. Most of the others ignored me. The open Hardware summit is going on as I type this - Follow it and check out what's being said. 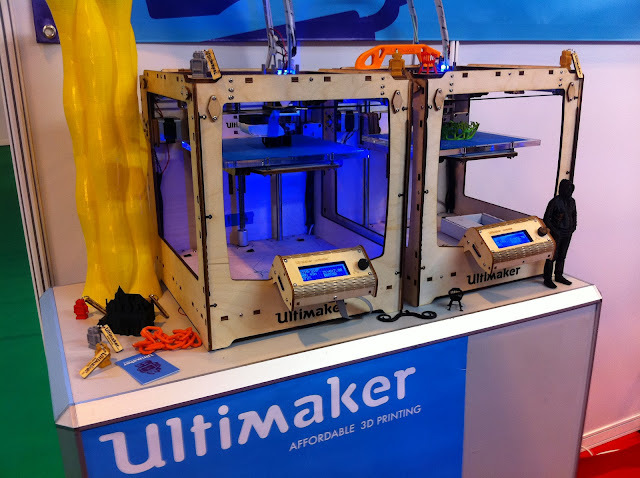 We may be getting our own Mini Maker Faire down in Bristol (UK) - keep looking out and googling for further announcements.